2.This line can be mapped to serve as an RTS, W0 output, or CLOCK output line of a serial port. The line can also be assigned to an I2C/SPI channel, or act as an interface line of the Wi-Fi add-on module, keypad, or an LED control channel. 3.This line can serve as a CTS, W0&1 input, or CLOCK input line of a serial port. 4.This pin is on the wireless add-on port. EM2000-...-A devices have a connector header facing down (towards the host PCB). "-T" devices have a female connector facing up. Add-on modules, such as the WA2000 can be plugged into this female connector. 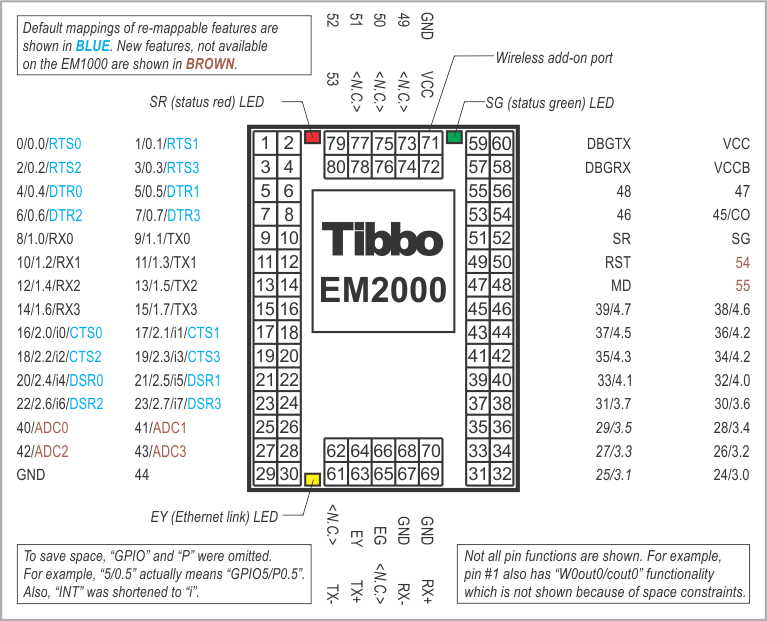 Standard EM2000 devices only have the landing pads on the PCB, no connector is installed at the factory. You can solder the WA2000 in by yourself or order the EM2000Nx device combination, in which case you will receive the EM2000 with the WA2000 installed (soldered in) on top of the module. RX, W1 input, and DATA input of the serial port 0. TX, W1 output, and DATA output of the serial port 0. RX, W1 input, and DATA input of the serial port 1. TX, W1 output, and DATA output of the serial port 1. RX, W1 input, and DATA input of the serial port 2. TX, W1 output, and DATA output of the serial port 2. RX, W1 input, and DATA input of the serial port 3. TX, W1 output, and DATA output of the serial port 3. General-purpose I/O line 40 (does not belong to any 8-bit port); ADC input 0. General-purpose I/O line 41 (does not belong to any 8-bit port); ADC input 1. General-purpose I/O line 42 (does not belong to any 8-bit port); ADC input 2. General-purpose I/O line 43 (does not belong to any 8-bit port); ADC input 3. General-purpose I/O line 44 (does not belong to any 8-bit port). General-purpose I/O line 55 (does not belong to any 8-bit port). General-purpose I/O line 54 (does not belong to any 8-bit port). RX line of debug serial port. Backup power for the real-time counter; connect directly to the backup power source (1.8-3.3V range). TX line of debug serial port. Positive power input, 3.3V nominal, +/- 5%, max. current consumption 100mA (100BaseT, full speed). Yellow ("link") Ethernet status LED control line. Green ("100mb") Ethernet status LED control line. Wireless add-on port, ground line. Wireless add-on port,3.3V power line of the available on this pin. Do not connect to the power source. To avoid current loops, only use pin #60 to power the device. Wireless add-on port, general-purpose I/O line 49 (does not belong to any 8-bit port). Wireless add-on port, general-purpose I/O line 50 (does not belong to any 8-bit port). Wireless add-on port, general-purpose I/O line 51 (does not belong to any 8-bit port). Wireless add-on port, general-purpose I/O line 52 (does not belong to any 8-bit port). Wireless add-on port, general-purpose I/O line 53 (does not belong to any 8-bit port).